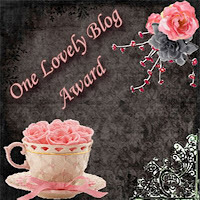 I was awarded the One Lovely Blog by We are ALL Special. Thanks so much!! I love finding other special ed blogs! (They are finally on the rise!) I hope you all will stop by her wonderful blog and see what she's been up to in her classroom! These ladies were all chosen because they offer so many freebies, teaching tips, and encouragement! They inspire me with their wonderful ideas! I hope you will check out their wonderful blogs if you are not familiar with them. Congrats! I love finding other spec. ed. blogs too! Thanks, too, for posting your fave blogs. I can't wait to check out some of them! I've been following you since the summer and love your blog too! Thanks for thinking of me for this award! I will pass it on and give you the credit you deserve! Thank you so much, Karla! I'm glad you found me, and thank you so much for your kind words and the award! I am now your newest follower! Love your profile pic :). Thank you for the award. I'm flattered. Your blog is awesome too. Thanks so much for the award, Karla! I will get a post ready! I hope you continue to find things you can use in your own classroom at my blog!